I must admit: I’m a wee bit late with posting, but how nice this interview that was published on the jazz in Europe website! Ellister van der Molen is one of the few female trumpeters at the top of her game within the European jazz scene. In recent years she’s also been a regular player in theater productions. Starting with the performance ‘A Night at the Club’, followed by ‘Swingin’ Harlem’. In ‘Swingin Harlem’ famous Dutch jazz musicians recreate an atmosphere reminiscent of jazz clubs in the New York district of Harlem before the Second World War. 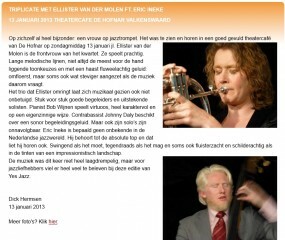 The theatrical performances also aim to stimulate the interest in jazz in the Netherlands. New York Round Midnight today. Major newspaper NRC had a very nice review about the show I’m happy to see the press are as enthousiastic as we are ourselves! Isn’t it a great feeling to bring jazz to the theaters? NYRM is the biggest jazz production of this moment, with 11 musicians on stage and a narrator. Combining the power of word with historic film projections and an allstar line-up the production brings you back to the jazz clubs of New York in the ’50s. The first reviews of Smalls NYC are there. 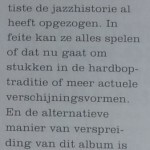 One of the major online jazz magazines in the Netherlands, Jazzflits praises the band’s relaxed and swinging performance and the modern approach of bebop. Rinus van der Heijden states in Jazzenzo that although the music is not revolutionary new, the level of playing is high and we all challenge each other to play exciting solos. In the meanwhile we have been on the radio already a few times: Radio6 – Jazz in the morning, De Concertzender – Holland Jazz, Sublime FM – Dutch Jazz and several local radio stations. Also curious how the cd sounds? You can stream the whole cd for free on the bottom of the product page and buy it if you decide you like it. Look at this nice review! 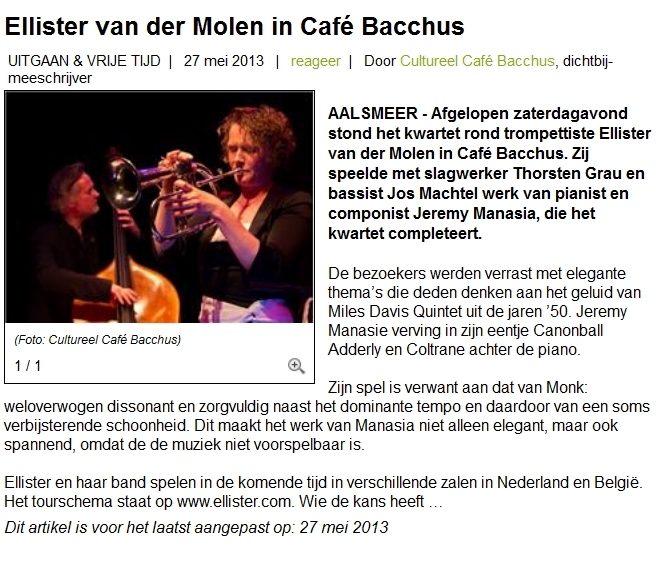 This Saturday evening the quartet of trumpettist Ellister van der Molen played in Café Bacchus. Together with drummer Thorsten Grau and bassplayer Jos Machtel they played work by pianist Jeremy Manasia, who completes the quartet. The visitors got a surprise of elegant themes, reminding of the sounds of the Miles Davis Quartet in the ’50s, Jeremy Manasia replaced all by himself both Cannonball Adderley and Coltrane behind the piano. His playing is connected to that of Monk: deliberately dissonant and carefully next to the dominant tempo and by doing so of a sometimes overwhelming beauty. That makes Manasias work not only elegant, but thrilling as well, because the music is not predictable. 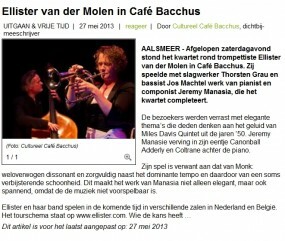 AALSMEER – Afgelopen zaterdagavond stond het kwartet rond trompettiste Ellister van der Molen in Café Bacchus. Zij speelde met slagwerker Thorsten Grau en bassist Jos Machtel werk van pianist en componist Jeremy Manasia, die het kwartet completeert. De bezoekers werden verrast met elegante thema’s die deden denken aan het geluid van Miles Davis Quintet uit de jaren ’50. Jeremy Manasie verving in zijn eentje Canonball Adderly en Coltrane achter de piano. Zijn spel is verwant aan dat van Monk: weloverwogen dissonant en zorgvuldig naast het dominante tempo en daardoor van een soms verbijsterende schoonheid. Dit maakt het werk van Manasia niet alleen elegant, maar ook spannend, omdat de de muziek niet voorspelbaar is. In the Netherlands there is only one jazz glossy, being Jazzism. How nice can it be to find a four star review of your album in that magazine?! 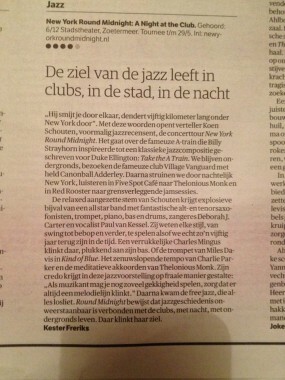 Dutch jazz journalist Bert Jansma always writes nice columns about the The Hague jazzscene. This time he devoted a major part to crowdfunding, taking my project Smalls NYC as an example. 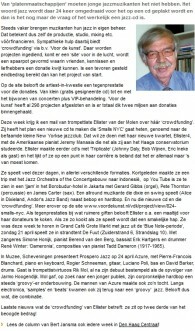 The article – which is written in dutch – also highlights some recent moves in my carreer such as Java Jazz, the Youtube film with Gerard Gibbs (organ), Pete Thornton (percussion) and James Carter (sax) and recent as well as coming concerts in Holland. To help crowdfund the project, please go to my page on Voordekunst. Op de debuut-cd ‘Three And One’ (2011) van Triplicate zat ‘good old’ Eric Ineke als gast achter het slagwerk. Collega-recensent Tom Beetz vroeg zich bij de bespreking van de eersteling van trompettiste Ellister van der Molen, pianist Bob Wijnen en bassist Johnny Daly af of de groep zonder Ineke wezenlijk anders zou klinken. Op het net uitgebrachte ‘Call Of The Wild’ geven de musici het antwoord: nee. Je mist een drummer niet. Wel klinkt het trio moderner. Er staan diverse eigen composities op de release. Het is opnieuw het beheerste geluid van Van der Molens trompet en flügelhorn dat de sound bepaalt. Wijnen en Daly soleren beslist niet onverdienstelijk, maar de heren zijn hoofdzakelijk dienend in de weer om de dame in het gezelschap te laten uitblinken. En dat doet ze. Met aanstekelijke partijen, die zwaar op de bebop leunen. De flügelhorn klinkt van zichzelf omfloerst, maar ook op trompet kiest Van der Molen voor de Chet Baker-benadering. Ellister van der Molen heeft goed geluisterd naar alle groten en daar haar voordeel mee gedaan. Haar techniek getuigt van veel ervaring en muzikale lenigheid. Triplicate bestaat uit eind dertigers en begin veertigers, die in tal van combo’s hun sporen hebben verdiend als ‘sideman’. Hun samenspel is zeer hecht en compact, maar die kwaliteit vertaalt zich niet in melodisch opvallende stukken. ‘Call Of The Wild’ lijdt helaas aan een zekere eenvormigheid. Recently two new articles were published about me. First of all Jazz Jong wrote about my Smalls NYC project on their website. Very cool! 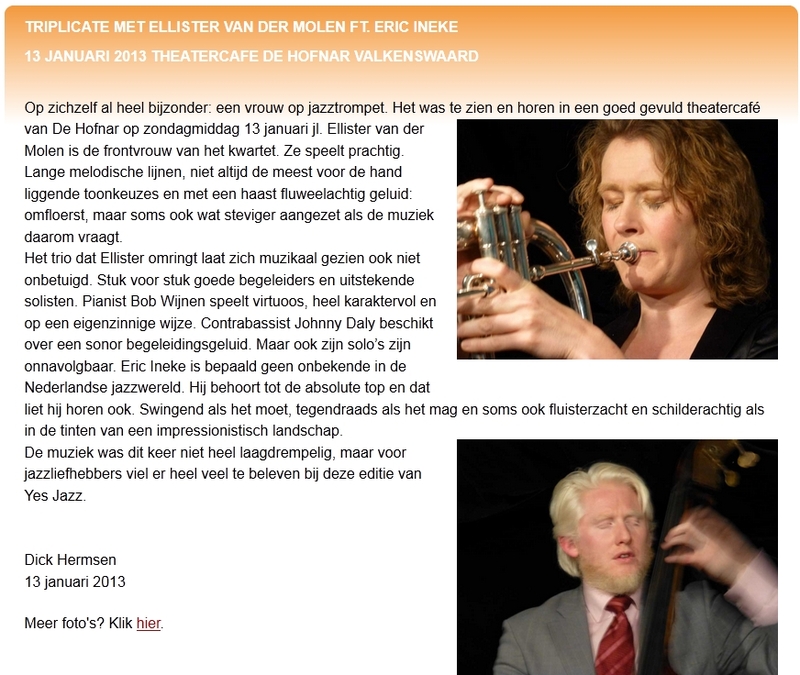 Even more cool: Coen de Jonge interviewed me for the latest edition of the Jazz Bulletin. Three pages that’s serious business I would say! Click the interview for a readable version. 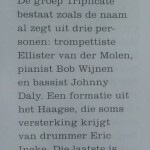 Although the band name Triplicate wasn’t really mentioned in this review (nor in the concert announcement) it really was a Triplicate gig we played in Valkenswaard last Sunday. Or actually: Triplicate plus one, for drummer Eric Ineke teamed up with us. And a noteworthy gig it was! Great musical interaction and – next to that – a very enjoyable afternoon, also thanks to the splendid organisation of YesJazz. 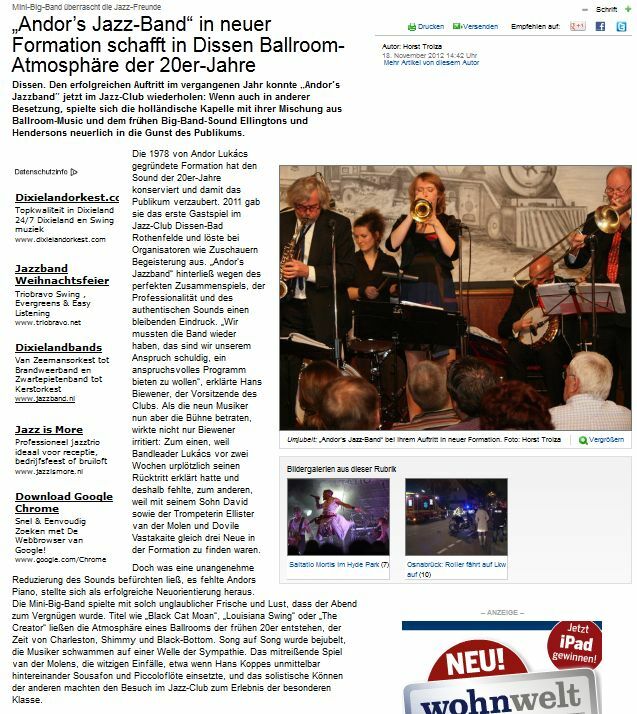 One of the guys in the band sent me an email pointing out there is a nice German review of the concert we played in Dissen last Saturday. 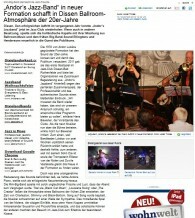 Without translating the whole article literaly, the article states that at first the audience seemed a bit disappointed when they saw there had been some changes in the line-up, but then the energetic liveliness of the band made he evening into a grand joy. They even mention my “rousing performance”.